This page displays a selection of projects we have undertaken recently and is a little taste of what we could potentially do for you. We have included contact information in case you like anything you see. We helped Beetle Cherry to create some detailed Paper Cuts on our Laser. 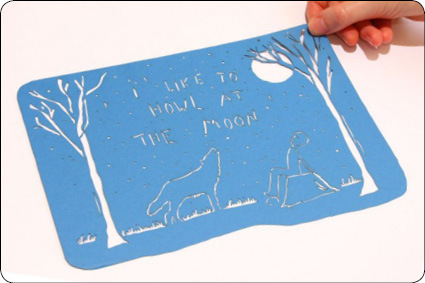 She also creates amazing illustrations and jewellery. Find out more by clicking on the image. 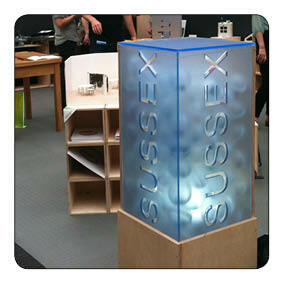 We worked with the Product Design course at the University of Sussex to create this stunning sign. The sign was later displayed at New Designers 2012. We offer a friendly service for crafters and small businesses. We regularly cut out dinosaurs and other animals for Brighton based jewellery company designosaur. Their designs are made from Acrylic and Cherry Veneered MDF. Find out more about designosaur by clicking on the image. We have helped to make models and prototypes for many students and businesses. 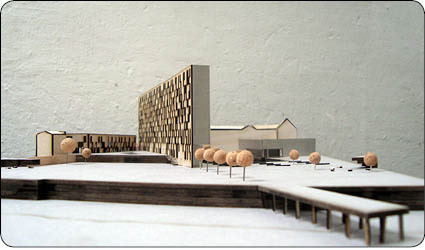 This is an example of a model designed by Christos an Architecture student studying at Portsmouth University. We have helped many artists and designers complete ambitious projects and installations. Above is a piece by hat maker to the stars Emma Fielden who created this striking headpiece for a statue of William Shakespeare in central London. Click on the image to find out more about Emma and her work. Copyright Brighton & Hove Plastics ltd 2019©. All Rights Reserved.